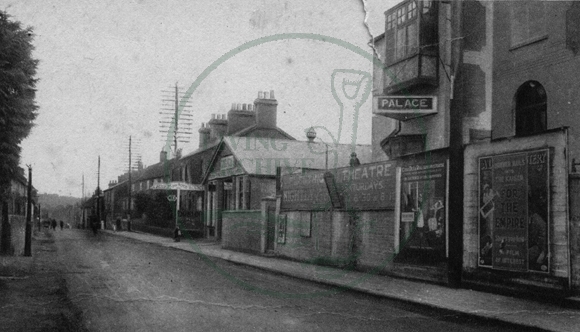 The Palace Cinema, High Street, Fenny Stratford in 1920s-1940s. The road in the photo is actually the A5 Watling Street and the direction is looking South towards London with the Brickhill hills in the distance, although the caption on the photo says 1920s – 1940s the cinema still existed in the 1950s. I grew up at Little Brickhill and lived there from 1946 until 1958, during which time I must have visited this cinema several times, Saturday morning pictures was a regular event, on many occassions we youngsters would walk from Little Brickhill and return after, the distance was about 2 miles each way. The other cinema, and probably the main one at this time, was the Studio in Bletchley road which also does not exist today, I have memories of seeing many of the old classic films at the Studio. As you look at the picture of the Palace Cinema, same side about the third telegraph pole back is where i was born at home, 28 High Street, opposite the Red House.